The self-governing administration of Jeju approved the opening of Greenland International Hospital on condition that it does not provide medical examination and treatment to Koreans as a kind of compromise to the Jeju residents’ opposition to the hospital that already has been built on foreign capital upon central government permit. Won said that the hospital - invested by China’s real-estate developer Greenland Group - will restrict services to cosmetic surgery, dermatology, internal medicine, and family medicine and emphasized the opening of the for-profit hospital will not affect public healthcare system such as health insurance as it is not applied by the National Health Insurance Act and Medical Care Assistance Act. 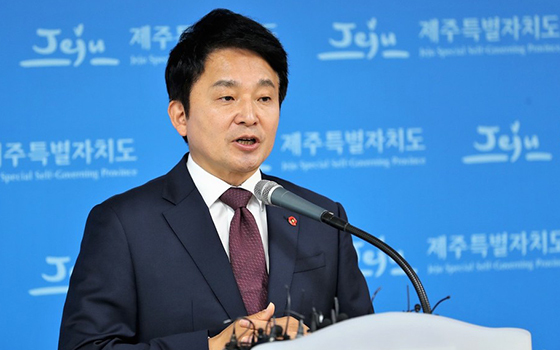 Won apologized to the province’s public opinion investigation committee for not accepting its recommendation to disapprove the opening of the hospital, saying that it was an “inevitable decision” for the future of Jeju. Won said that the province will do its best to understand the committee’s intent of recommending non-permission to shrug off concerns over weakening of public healthcare. Jeju will also thoroughly manage and monitor operations of Greenland hospital to impose strong penalty should the hospital violate the condition for the opening. Jeju Province decided on the conditional opening to boost the regional economy and tourism and also as not to stoke unnecessary conflict and lawsuit for delaying the legitimate project that was approved by the central government. Greenland Group invested 77.8 billion won ($70 million) to build the 47-bed hospital whose construction was completed summer of last year upon winning a license from the government in 2015.